Are you preparing for the PMP Exam? 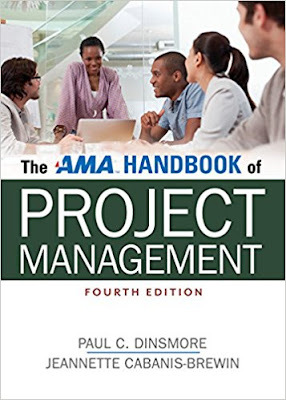 If yes, tell me honestly - do you know that The AMA Handbook of Project Management is a PMP Exam Prep book? Handbook and Exam Prep Book? Doesn’t sound right, isn’t it? You might have heard about PMP Exam Prep books from Rita Mulcahy, Andy Crowe and Kim Heldman. But not many PMP aspirants are familiar with The AMA Handbook. And what if I tell you that you can get it for free. Would you be interested to know more? Read on. From the name it sounds like one of those “boring” reference books which do not offer any information of practical use. However, a closer look reveals why it has been awarded the prestigious 2007 David I. Cleland Project Management Literature Award, presented by the Project Management Institute (PMI). The book is not only an authoritative guide on Project Management concepts and theories, it covers several case studies and offers advice and practical solutions to many common Project Management problems. Though it’s a great resource for Project Managers, it’s an equally good resource for PMP aspirants. The first section of the book is completely based on the PMBOK Guide and covers all the Knowledge Areas as described in the PMBOK Guide. It provides a refreshing perspective to the concepts in the PMBOK Guide that is quite different from that in traditional PMP Exam Prep books. The second section provides a very good coverage of Ethics and Professional Responsibility in Project Management. The third and fourth sections talk about important issues in Project Management and the fifth covers industry application of Project Management Practice. The list price of the book is around $50, but I can help you get it for free. Yes, if you are a PMI Member, you can get this book for free on books24x7. Read my earlier post 250 Free Project Management books for PMI Members for more details. If you are interested in the hard copy, you can get one from Amazon at a discounted price. If you are preparing for the PMP Exam, and tired of the traditional “boot camp” approach to exam preparation, I suggest you refer to this book for a refreshing change. More importantly, if you have failed the PMP Exam in the previous attempt and preparing for re-examination, this book may help you see the concepts in a different light. So, go ahead and give it a read. If you like it, spread the word and help your fellow PMP aspirants and Project Managers. And if you get a chance, stop by again on this blog and drop a helpful comment. You can purchase the book from Amazon by using the links below. I feel the Harold Kerzner's Project Managment - A systems approach to planning, scheduling and controlling is written more omprehensively and completely than AMA Project Management book. I read both. For example, AMA book covering about Time management only in four pages.. for the same topic in Kerzner's book, it spanned more than 50 pages. I agree with you. Dr. Kerzner's book is the 'bible' for Project Managers. I also plan to review that book in near future. Thanks for bringing up a good point. What I like about The AMA Handbook is the succinct description. Moreover, it's free for PMI Members (though Dr. Kerzner's book is also available for free to PMI members, but only the 8th edition, which is based on PMBOK 2nd Ed). Have a question regarding topics covered in PMP. I purchased PMP exam simulator, it has questions about interventions, implementation theory, risk types,MSP process. Would we see these questions in PMP exam?